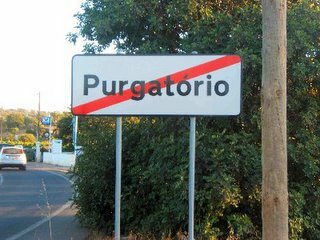 Purgatorio – Marc Heinrich’s blog is only a few months old and today he got more hits than I did. His “you might be emerging if . . . post” that i mentioned last week is already legendary. Challies made him King For a Week, and I am making him Skinny for a Week. 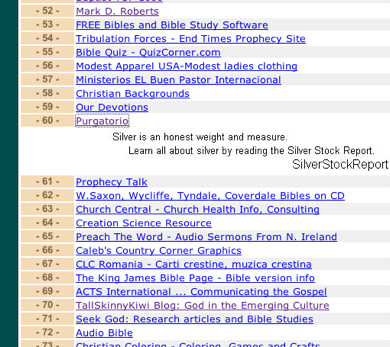 If you go and visit Marc during the week a few times, you might help him climb over Mark Roberts on the Christian Top1000. Mark Roberts is a blogger who gets more hits than me EVERY WEEK. Every week – yes. . . go on and see who he is . . give him some more hits to ensure his dominance over my blog. . . see if i care . . sob! sob! BTW – if your emerging church blog gets a massive surge of visitors or you overtake me, let me know and I might mention you here. Jordon Cooper is only 12 permanent links away from kicking me off my perch at Technorati – Emerging Church – a dozen of you could accomplish that if you added Jordon to your blogroll. Go ahead . . make his day. He already has more permanent links than me. I would be happy to concede to Jordan. I wish Jonny Baker would overtake me because he has a better blog than mine and his Worship Tricks category is better than anyones. And Jason Clark gets favored by Google over me on emerging church issues..
And did you see EmergentNo’s Carla Rolfe at Number 4? Way to go Carla. She may not be a big fan of the emerging church . . . but she runs a good blog and deserves to be there. Our dear Fundamentalist brothers and sisters are very quick to link to each other within their group [great example of the HUI – homogenous unit principle – on the blogsophere] and they end up bumping each other up the ladder very quickly. They also write for an audience that by and large still visits their blogs rather than receiving new feeds in Aggregators and that gives them more visibility. They may be a newcomers in our backyard, but they are here to stay and we should get used to them. And even though the emerging church bloggers have had a great 4 years of dominating the cyberspace, the fact is the Fundies write more, link more often, and tackle controversial issues that attract more hits. I am not advocating blogging about controversial subjects – in fact, the bible tells us to avoid endless controversies and to promote peace. I am just saying that blogs with a higher level of sensationalism and controversy will always get more readership. Site counters and search engine aggregation are different everywhere you look. Some search engines have never heard of you and some enthrone you as king. Some site meters are stingy and others exhuberantly generous. I have just recently (since getting knocked of the Feedster Top500 and forced to face my defeat) begun to register my blog at search engines and ecospheres. Thats why there are more badges on my right column. Most of those search engines did not acknowledge me at all. Lamers! Hate getting snobbed. The Truth Laid Bear Ecosystem did not recognize me but knew all of my friends. I refuse to add their ugly site counter on my blog (tool of the devil for vanity and pride) so they may not acknowledge me ever, but thats their fault. Back in the 90’s, when i was the only Christian blogger that I knew of, our blogosphere was like a village of 200 people. Today its a megaolopoloblogopolis with tens of millions of blogs and its easy to get ignored. My guess is that if you registered your site with all the aggregators and search engines, like I am beginning to do . . with bitten lip . . . you will be have a lot more people come to visit. But lets wait and see. Anyway . . . congrats Marc on your excellent blog. Love all the images! Now go and overtake Mark D. Roberts. And after him, set your sites on HughHewitt.com. Thanks for the honor. I do need to get skinny, but I’ll save that for my pictorial post on fat american evangelicals. I look forward to continued involvment from EC folks and others on my blog. If we tip enough sacred cows over we might find that Jesus was standing there all along. dude, I’m #71 on Technorati…watch your back! I figured out one must be registered on Technorati to show up – and now, drumroll, I’m no. 6. God help us. Peace to you Andrew and to the Northern Islands. i updated my blog, which then appeared on the emerging church tag, but now it does not appear there. why would this be? Check out http://www.aripaparo.com/archive/000632.html for a list of lots of blog search engines. Time-saving. check that you are doing the blog search at technorati and not the regular search. Does technorati take time to process stuff? Registered (241 links from 70), but doesn’t show up when I do a blog search for Emerging Church. Any ideas? sometimes i see things that were posted only 5- 10 minutes earlier. when you registered your blog, you did not identify “emerging church” as one of your categories. Weird. It’s definitely got that tag, as it comes up in the profile. But when I click the link on that tag, it’s not listed. Probably sort itself out in a day or two. Hope you’re well… Seem re-invigorated post-tour! Hopefully cross soon. I couldn’t agree more. Let’s get the focus off of the stats and back on what really matters… my blog. my wife spent the afternoon helping a friend and i couldnt resist. …i will try again in the new year. technorati is giving me all sorts of weird resposes. Get over yourself guys. It sounds like a bit of pride is getting in the way of a good blog. It’s the old modernistic paradigm my blog is bigger than yours syndrone. Just from an outsiders view its what turns me off churches as well. Say something useful about the kingdom of God rather than comparing the size of your respective appendages.